The number of non-spam messages that SpamSieve has filtered. The number of spam messages that SpamSieve has filtered. The average number of spam messages received per 24-hour period. The number of good messages that SpamSieve identified as spam. The number of spam messages that SpamSieve identified as good. The percent of messages that SpamSieve identified correctly. The number of non-spam messages that are used to identify spam messages. 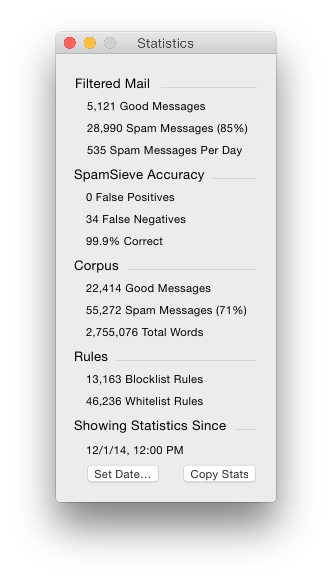 The number of spam messages that are used to identify spam messages. The total number of unique words in the corpus. The number of rules on SpamSieve’s blocklist. The number of rules on SpamSieve’s whitelist. You can copy all the statistics to the clipboard using the Copy command in the Edit menu or by clicking the Copy Stats button. Normally, SpamSieve shows statistics for all the messages that it processed since it was installed. Because the accuracy and the number of messages you receive change with time, you may wish to only see recent statistics. Click the Set Date… button at the bottom of the window to control which old statistics are hidden from view. You can edit the date and time shown in the sheet, or enter an entirely new date. SpamSieve will also accept dates specified in natural language, such as “last Sunday at dinner” or “today.” The Now button enters the current date and time. If you’ve chosen a suitable date and the “Filtered Messages” section shows zero filtered messages, that means that your mail program did not ask SpamSieve to filter any incoming messages. You should check to make sure that the mail program setup is correct.